These light and fluffy Cinnamon Roll Greek Yogurt Pancakes are sure to keep you satisfied all morning with over 20g of whole food protein! They’re gluten-free thanks to the oats, whipped up in the blender in under 5 minutes, and taste JUST like a warm cinnamon roll! Preheat a skillet over medium heat and generously coat it with cooking spray or oil. You want to make sure that it's nice and hot before you start cooking your pancakes. Add all the pancake ingredients to a blender in the order listed and blend on high until oats are fully broken down and batter is smooth and frothy. Allow the batter to sit for a few minutes so that it has a chance to thicken up while you make the cinnamon swirl - simply mix all the ingredients together in a small bowl and place it beside the stove. Pour the batter straight from the blender onto the skillet until desired size of pancakes is reached. Cook the pancakes until the edges have set and bubbles begin to form on the tops. Using a spatula, flip and cook for another 1-2 minutes. ***** Repeat until all the batter is gone, making sure to coat your skillet again with oil between each batch. 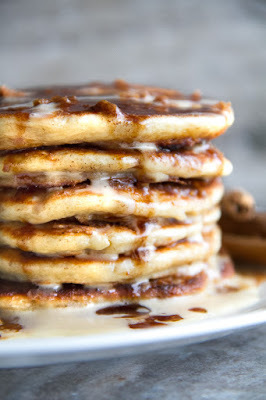 To assemble, spread a small amount of cinnamon sugar filling on one of the pancakes before placing another pancake on top. Spread that one with more of the filling, and repeat the process until all the pancakes are stacked. To make the frosting, mix the protein powder with enough almond milk to get it to the consistency you want. Pour it over the pancake stack and enjoy! * make sure to use certified gluten-free oats if you need these to be gluten-free. ** start with 1 Tbsp (15 ml) of almond milk and only add a second if you feel the batter is too thick. *** you can also use melted butter. **** you can also use brown sugar. ***** if you find that you're having a hard time getting the insides of the pancakes to fully cook, cover your skillet with a lid while they cook. 0 Response to "cinnamon roll greek yogurt pancakes"
The BEST Coffee and walnut cake....EVER!!!! !